For a better understanding of what I had in mind when I designed the PHOENIX loudspeaker system, you should read <The Basics ...> pages, which give you general observations that influenced this unconventional speaker project. The reasons behind specific design solutions are addressed on the | Design Models | page and in Ref.2. Measured frequency response curves for the PHOENIX are shown on the | System Test | page. The project documents the evolution from a previous active speaker system in which I used two small satellites and a closed box woofer with a novel equalizer to extend its low frequency response . You will find helpful information about many issues in speaker design in the description of that earlier project, Ref.12. Take a look at page 1 or the full article. In general, I tried to give specific meaning to every sentence on this web site. If you do not find your answer or are confused after reading what I said, then do not hesitate to send me your question. And, for my benefit, let me know what you did with my response. I always appreciate your recommendation for a well recorded piece of music to listen to. Should you have built the PHOENIX or parts thereof and made interesting observations or found ways to improve the design, then send me a note. I am always interested in new insight on how to move sound reproduction closer to the original. But please, don't ask me what changes are necessary to accommodate your favorite driver. I think I have outlined in detail how you can determine that for yourself. If not, then stick exactly to the PHOENIX project. Q1 - Why do you use 8" drivers for the midrange when 6.5" or 5" drivers would give better off-axis response? Q2 - My room size is less than 250 ft2 (22m2) and I need a smaller speaker. How can I modify the PHOENIX design? Q3 - How do I upgrade the system for rooms larger than 600 ft2 (55m2), or because I like to play it larger than live? Q4 - I want to use woofer XYZ which has larger Xmax than the 1252DVC. Which other parameters are important? Q5 - How much sound output can you get from the open baffle woofer? Q6 - How much power will it take to drive the woofers? Q7 - The price of the Scan-Speak drivers is a problem. Is there any valid substitute without changing the design? Q8 - Would a narrower (<12.5") main panel give sharper stereo imaging, due to reduced delay of edge diffraction? Q9 - Could the length of the main panel be extended so that separate stands are not required? Q10 - Could the woofer be adapted to work with existing panel speakers - e.g. Quad ESL63? Q11 - What is the total cost of all the hardware for building a pair of PHOENIX loudspeakers? Q12 - What happens to the parameters Vas, Qms, Qes and Qts when you connect the two voice coils of the 1252DVC in series? Q13 - Is a printed circuit board for the crossover/eq available? Q14 - What is the low frequency sound pressure level from an open baffle speaker with a given effective piston area and excursion? Q15 - How would you modify the crossover/eq circuit to work with a "regular" small monitor, instead of the main panel, and use the dipole woofer? Q16 - Could you drive the main panel with a tube amplifier? Q17 - Why do you not show waterfall response plots for the PHOENIX when your test equipment is capable of producing them? Q18 - Which types of distortion do you measure? Q19 - Why do you use a 12 dB/oct crossover between woofer and midrange when the crossover to the tweeter is at 24 dB/oct ? Q20 - What is the sound pressure level at 1 m for 1 W of power under anechoic conditions? Q21 - Why does SPL increase 6 dB for two drivers in parallel when the electrical power consumed only increases by 3 dB? Q22 - How would you describe the sound of the PHOENIX? Q23 - Can you point me towards people who have built the PHOENIX? Q24 - What is your process for designing an open baffle speaker? Q25 - Why do you not use a rear firing tweeter or a dipole ribbon tweeter? Q26 - Why use active crossovers when passive crossovers require fewer components and amplifiers? Q27 - How do I test the PHOENIX crossover/equalizer circuit board? Q28 - How high in frequency can you push the dipole woofer? Q29 - How do you measure cone excursion of a driver? Q30 - Can a dipole woofer be placed in a room corner? Q31 - Is there an optimum room placement for a dipole? Q32 - How would you increase the output capability of the Phoenix? Q33 - Is a pre-assembled crossover/equalizer available? Q34 - What is the optimum Qts for the drivers of a dipole woofer? Q35 - How does the new ORION compare to the PHOENIX? Q36 - Are there better drivers for the PHOENIX? Q38 - How do diffraction effects show up? Q39 - How much power does it take to drive a dipole woofer? Q40 - Can the PHOENIX be build with passive crossovers? A1 - I am using 8" drivers because the crossover to the woofer will be around 100 Hz and because an open baffle speaker has to move more air than a box speaker due to the progressive acoustic short circuit between front and back. The open baffle gives significantly wider dispersion at high frequencies than a box speaker with the same 8" driver on the same baffle, see Ref. 2, Design Models F. This is caused by the radiation from the rear of the baffle, having undergone enough phase shift as it comes around to the front, so that it adds to the total sound at off-axis angles. See Dipole Models. capability drops. Thus, the linear volume displacement - which makes SPL - goes down even faster than diameter squared. What is gained in wider dispersion, which is inversely proportional to diameter, is more than lost in increased distortion. Low distortion is higher on my priority list than dispersion. Since dispersion is widened with a properly sized open baffle, there is no good reason for using a smaller diameter driver other than if the 8" driver had poor behavior in its cone breakup frequency region. A 8" driver will typically have twice the useable volume displacement of a 6.5" driver, but the effective diameter increase is only 30%. Thus, when used in an infinite baffle or in a box, the 8" driver will have the same dispersion at 1.5 kHz as the 6.5" driver has at 1.95 kHz. The smaller drivers are so popular in commercial products because narrow loudspeaker cabinets are much more acceptable in the home for visual reasons, a trend that is conveniently supported by theories about the detrimental effects of edge diffraction. Note also how many of these speakers use two drivers in MTM or MMT layouts to obtain adequate output. A2 - You could eliminate one of the 8" drivers and make the main panel only 16" tall. This will sacrifice 6 dB in acoustic output capability for the same non-linear distortion level. The gain of the midrange channel in the crossover/eq needs to be increased 6 dB. I would not recommend to also go to a single woofer, i.e. 6 dB less bass output, because subjectively this is a much more significant reduction in output capability (observe the close spacing of the equal loudness contours at low frequencies, Fletcher-Munson). The reduced height main panel would also make for a high performance center or surround speaker with very uniform and smooth off-axis response, but for distortion should not be pushed below 100 Hz. A3 - Now you are into a 4-way system. You could add two 10" drivers (e.g. Scan-Speak 25W8565) in the space below the main panel as was done in the Audio Artistry Beethoven and double up on the woofers. If that is not enough capability, then you might add two more 10" drivers on top of the main panel and use eight 12" drivers for each woofer as in the Audio Artistry Beethoven-Grand loudspeaker system. Extreme as these designs may seem, the goal here is to keep non-linear distortion low at high volume levels or, conversely, have very low distortion at normal levels. I think it is important to be able to play back at live like levels. If the system has low distortion it will not sound loud, just natural. The level needs to be realistically high, so that the ear produces the same distortion and timbre as it would at a live event. Then you can experience maximum involvement and enjoyment. CAUTION: Such 4-way open-baffle speaker project will lead to endless questions and frustration unless you have good electrical and acoustic measurement capability and a solid understanding of what each element in the system is supposed to do. You cannot adjust relative channel levels by ear and expect to obtain a speaker that is true to the original. Unless you have these resources your chances of improving on the PHOENIX are slim and you might even end up with lower performance than if you had followed the PHOENIX design. A4 - I use two drivers to double volume displacement and to reduce even order harmonic distortion by running them with opposite cone motion. The requirements for an open baffle driver are quite different from those for a closed or vented box design. Smaller values of Qts increase roll-off towards the low frequency end and require more equalization than the 6 dB/octave boost for dipole cancellation that I used in the 10-300LP stage of the Crossover/EQ. Most drivers have too strong a motor for dipole applications and are over-damped in an open baffle cabinet. When the driver is mounted into the woofer cabinet, air mass is added to the free-space moving mass of the driver. This lowers the mechanical resonance frequency Fs and increases Qts by approximately the same percentage. The amount of change is difficult to predict accurately and best measured using f0Q0.gif from Ref.12. I do not recommend the use of drivers with very small magnets and Qts >> 0.8 in an attempt to compensate for the 6 dB/oct open-baffle roll-off with a rising driver response. Such equalization is crude at best. I prefer active 6 dB/oct low-pass filter equalization. The filter cut-off frequency should be set in conjunction with Qts and Fs to avoid a peak in the group delay of the resulting 3rd order acoustic high-pass filter. See FAQ19 for acoustic effects. Note that Xmax = 0.5 [(voice coil height) - (air gap height)] is merely proportional to the linear excursion. Different drivers with the same Xmax do not necessarily have the same linear excursion range! The design and construction of the spider, surround, and magnet gap region have strong influence on the actually useable excursion range before distortion becomes excessive. A driver with Xmax = 12 mm will generate quite a bit of aerodynamic noise, i.e. distortion, at such high excursions. The space behind the spider needs to be open to the outside to minimize noise. The pole piece should have a large vent, or the cone should have no dust cap, so that air trapped behind the dust cap does not contribute noise. For a qualitative evaluation of a new woofer perform a simple test. Put a dot of white paint on the cone or dust cap to monitor excursion. Connect the driver to a power amplifier and drive it from a signal generator set to 35 Hz. Hold the unbaffled driver in your hands. Increase the generator output and observe how quiet the driver remains and how much excursion it can handle before sounding obnoxious. Remember that an open baffle cabinet will not attenuate this noise. Lower the frequency and repeat the test. Be careful not to overheat the voice coil or to destroy the driver mechanically!! The burst capability of the HP 33120A Arbitrary Waveform Generator is wonderful for this work. Unfortunately, the majority of drivers that I have evaluated required no further investigation after this test. The Gefco X6100 and especially an Eminence Speaker Corporation 12-6676 proto type performed well and are very applicable. The Gefco X6100 driver is available from Madisound . The Eminence 12" proto type was built on a similar platform as the Adire Audio "Shiva" driver, but specifically optimized for open baffle application. It would require a slightly wider cabinet, but should give 3 to 5 dB more SPL for the same distortion level as the Gefco X6100. Cost, though, is at least twice that of the X6100. If you listen to a lot of organ music and woofer cabinet size is very important to you, then instead of stacking two PHOENIX woofers with four X6100, you could have nearly the same SPL output from a pair of theses drivers in a smaller cabinet. For an update and somewhat disappointing conclusion of this project see Woofer2 and for a real, higher output alternative see Woofer3. There are possibly other 12" or 10" drivers on the market with equal or larger useable, linear volume displacement than the 1252DVC and X6100 . These two drivers, though, have proven themselves for open baffle application and provide a sensible tradeoff between cabinet size, distortion performance and cost. 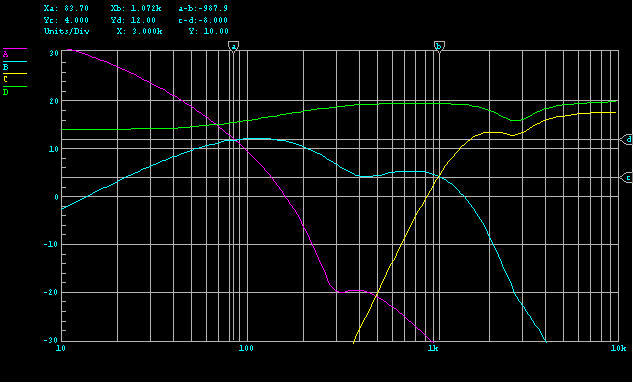 1252DVC: Re = 5.5+5.5 ohm, Fs = 17.4 Hz, Qts = 0.5, Xmax = 0.5"p-p.
A5 - I give a formula in Ref. 2 and in Design Models A1 that relates the sound pressure level from a driver on an open baffle to the SPL from the same driver in an acoustically small closed box, assuming that both have the same cone excursion. At frequency Fequal the SPL is the same for either driver arrangement. The open baffle driver output decreases at 6 dB/oct below this frequency relative to the closed box. Above this frequency it increases to an on-axis peak that is 6 dB higher than the SPL from the box. The peak occurs when the distance D between front and rear equals 1/2 wavelength, i.e. when the rear wave is phase shifted 180 degrees and in phase with the front wave. At 30 Hz the two woofer cabinets of the PHOENIX are equivalent to a single 12" in a closed box, assuming that the box speaker is flat to 13 Hz (-3 dB). Above this frequency, of course, the two open baffles generate considerably more SPL than the single 12" driver in a box. At 60 Hz the dipoles would be equivalent to two of those 12" box woofers and at 120 Hz equivalent to four in terms of maximum SPL. You can add 6 dB to this capability by doubling the dipole woofers and stacking them on top of each other for a height of 28", but this might negatively affect the WAF. The primary benefit of the stacked woofer arrangement would be reduced non-linear distortion when listening at the same SPL as before. A7 - The Vifa D27TG-45-06 (also the reliable D26TG-35-06) fabric dome or D25AG-35-06 aluminum dome tweeter and P21WO-20-08 woofer could be alternate drivers for the main panel. The mounting hole dimensions need to be changed and some of the component values in the crossover/eq. While this will give you an excellent, natural sounding speaker, it has not quite the same clarity and dynamics as the PHOENIX. See FAQ22. A8 - Diffraction is a difficult subject. I will try to give a simplified explanation of how diffraction works for an open baffle speaker after looking first at diffraction in general, and then for a closed box speaker. See FAQ 38 for actual measurements of diffraction. Fundamentally, diffraction is about the transition between an acoustic wave propagating into one space first and then into another space of different volume later. The effect, at a given point in space, is a change in sound pressure and, correspondingly, a change in the frequency response. The effect will be different whether the point is on-axis or off-axis. Take, for example, a small source on a flat baffle. At low frequencies, where the wavelength is much larger than the distance from the source to the baffle edge, the source radiates essentially unimpeded into full space (4pi). At higher frequencies and shorter wavelengths, the baffle begins to look more like a large plane because it takes increasing numbers of wavelengths to reach the edge of the baffle. The source now radiates essentially into half-space (2pi), but with delayed reflections from the baffle edge that cause ripples in the frequency response, and which become weaker as the edge recedes in terms of wavelengths. On average, the pressure at a distant on-axis point in space will be 6 dB higher at high frequencies, than at low frequencies. Assuming that the source was located at the tip of a 90 degree cone of finite length, then at long wavelengths radiation would again be into full-space. At short wavelengths radiation is only into 3/4-space and on-axis pressure increases 20log(4/3) = 2.5 dB, on average. If the source was radiating into a 90 degree cone of finite length, then radiation would transition from full-space to 1/4-space, resulting in a 12 dB step from low to high frequencies, measured on axis and at a distance much larger than the cone size. Let's now look in more detail at diffraction at the front panel edges of a closed box speaker with rectangular baffle. Assume the driver cone moves abruptly outward and causes a local air pressure increase. The pressure increase propagates at the speed of sound (343 m/s) away from the cone into an environment that is bounded on one side by the front panel. Until the pressure wave front reaches the edge of the panel, it looks as if the driver was radiating into half-space. When the wave encounters the edge it suddenly sees an expanded space and the pressure drops. This pressure drop occurs all around the front panel edge, though at slightly different time, depending upon the distance from a particular point on the edge to the cone. All together, the pressure is reduced to 1/2, i.e. it drops 6 dB, because the volume of space encountered by the wave has doubled. We can think of this phenomenon as if a delayed wave of half the strength of the original wave and with opposite polarity was propagating out from the circumference of the front panel. When we monitor this behavior from a point in front of the box (e.g. 1 m), then we observe first the arrival of the original pressure increase and a little time later a pressure decrease when the wave from the cabinet edge arrives. Note, that our conceptual model assumed that the pressure increase occurred in such a short time interval, that we can resolve the ensuing pressure decrease, which is no longer abrupt, but smeared because of the unequal distance from the panel edge points to the cone. If the panel had an effective width of 8" (0.2 m), and the cone was centered on the baffle, then the pressure decrease would occur 0.1m / 343m/s = 292 microseconds after the increase. To resolve the two events as separate from each other, the pressure must reach its final value in an interval shorter than 292 us, which means the driver must have a bandwidth greater than 1 / 292us = 3430 Hz. A slower pressure increase as produced, for example, by a 300 Hz tone would almost immediately be decreased by edge diffraction to 1/2 its starting value. Thus, if we look in the frequency domain, the pressure response from an idealized point source on a finite size baffle will start at low frequencies with a value that is 6 dB lower than the value around which the response oscillates at high frequencies. The oscillation occurs due to the phasing between initial sound and edge diffraction, adding and subtracting from each other. By making the baffle narrower the transition to the oscillatory region moves higher in frequency, e.g. to above 2000 Hz in the above example. As the driver itself, due to its piston diameter, becomes more directional with increasing frequency, it also illuminates the panel edge with less strength, which then reduces response irregularities caused by diffraction. This comes into play when the effective piston diameter becomes larger than 1/3 of a wavelength. A smaller diameter driver, 6" versus 8", illuminates the the panel edge stronger than the larger driver for a given frequency and panel width, because it is less directional of itself. This effect is offset to some extend by making the cabinet proportionally narrower, which moves the response irregularities up in frequency. I think the popularity of 6" drivers is mainly driven by greater consumer market acceptance of visually less obtrusive narrower cabinets. In general, the effect of cabinet diffraction can be observed and measured in the frequency domain as on-axis and off-axis frequency response irregularity. It shows especially strong in the on-axis response of symmetrical driver layouts. Diffraction effects can be seen most easily in the time and amplitude response to shaped tone bursts. References: H. F. Olson, Acoustical Engineering, 1957, pages 21-23. Anyone attempting to come up with a simple calculation of diffraction should first read: G. G. Muller, R. Black, T. E. Davis (all from Bell Labs), The Diffraction Produced by Cylindrical and Cubical Obstacles and by Circular and Square Plates, JASA, Vol.10, 1938. If I have not lost you by now, then let's talk about open baffle diffraction effects with the above in mind. Assume a small unenclosed piston source in the center of a circular, flat baffle. The source radiates towards the front and with opposite polarity towards the back. A pressure increase in front is associated with a pressure decrease in back of the baffle. Observing again the response to a stepwise increase in pressure at some on-axis distance in front of the baffle, we see the initial pressure increase, which drops to 1/2 when the edge diffracted front side wave arrives. At the same time we also receive from the backside of the baffle that 1/2 portion of the wave, which was diffracted around the baffle edge into the frontal hemisphere. The 1/2 of the backside wave is of opposite polarity to the front wave and together with the front edge diffraction cancels the front wave completely(!). If the baffle had a 12" (0.3 m) diameter, then we would observe a 0.15m / 343m/s = 437 us duration pulse in response to the pressure step from the point source. You might say this is a much stronger diffraction effect than for the closed box - and you are correct - but it is also the characteristic response of an open baffle, dipole source - after equalization. Modeling the response with a stepwise pressure increase and decrease implies an integration of the systems impulse response. Integration in the time domain is equivalent to boosting the low frequencies at 6 dB/oct in the frequency domain. The 437 us duration pulse is described by a sin(f)/f frequency response function, which exhibits a flat response up to the frequency where the diffracted wave is delayed by 1/2 wavelength, i.e. where it adds in phase to the initial wave. For the 12" baffle this frequency is at 343m/s / 0.3m = 1143 Hz. At higher frequencies the response rolls off at 6 dB/oct with periodic dips and peaks unless the equalizing 6 dB/oct boost is leveled out. See Design Models A. In practice you would not use a circular baffle to avoid the strong, comb filter like oscillations in response at high frequencies. A rectangular baffle smoothes out diffraction irregularities. In addition, as the driver itself becomes more directional with increasing frequency, the shape of the baffle becomes less critical because its edges are less illuminated. Ultimately, it is the on-axis and off-axis frequency response of the equalized speaker that tells how well diffraction effects have been integrated into the design, regardless of the speaker type, cabinet shape, baffle width or drivers used. Narrower cabinets are just easier to work with for box speakers. A real feature of the PHOENIX is the smooth off-axis response that mimics the on-axis response, but with decreased amplitude as the angle is increased. You can see various frequency response data on the | System Test | page and in Ref. 2 . A9 - Extending the main panel to the floor would create a large, potentially radiating surface area, if excited into vibration. I would recommend to extend the back spine and side panels, instead. The three legs would need to be cross-braced and solidly tied into a base. Suspending the panels from the ceiling is probably the optimum solution if hooks can be safely fastened to carry the panel weight. Rope and panel mass form a mechanical low-pass filter between driver cone movement and ceiling. The speaker is operating above the pendulum resonance and in the filter cutoff frequency range. A10 - A PHOENIX like open baffle, dipole woofer would be the ideal complement to a variety of planar, open baffle, dipole speakers ( e.g. photos at Audio Page ). The woofer channel of the crossover/eq circuit could remains unchanged for the 100 Hz, 12 dB/oct, L-R low-pass filter section of the crossover between woofer and existing speaker. The gain setting resistor ladder values (8.25k & 5.62k) would have to be modified to account for differences in sensitivity between woofer and existing speaker. Assuming that the existing speaker has low frequency extension to at least 50 Hz, but is limited in SPL capability, then the high-pass filter section of the crossover, to drive the existing speaker, could be simply formed by a second order HP with two real axis poles at 100 Hz. The filter response could be realized with two cascaded 1st order Butterworth filters or the 12 dB/oct circuit topology of xo12-24.gif, which is also used on the crossover/eq printed circuit board. Thus, you could modify the second 1440HP filter section in the tweeter channel to realize the 100 Hz high-pass. Simply replace the 2.37k and 4.64k resistors with 51.1k resistors. The two 33 nF capacitors remain. None of the other components in the tweeter and midrange channel are loaded onto the circuit board. Add a jumper wire from the buffer output to the 33 nF input capacitor of the new high-pass and use the tweeter output to drive the power amplifier of your existing open baffle speaker. Alternatively, you could use my general topology printed circuit boards to define your own filter layout and configuration. If the existing speaker has its own roll-off in the 100 Hz region, then the crossover high-pass filter design would become more difficult and depend on the speaker's measured performance. This might be a situation where full equalization of the midrange highpass behavior becomes necessary. An active circuit (biquad) allows to shift the poles in the midrange response to the desired crossover frequency. A circuit with this type of response can be constructed using one of my general topology printed circuit boards. A12 - The answer is not immediately obvious, so let's look at a single voice coil first. I will ignore the voice coil inductance which has little influence at low frequencies. Using the force-current analogy we can transform the mechanical driver parameters to appear as electrical components between the voice coil terminals. The driver moving mass becomes a capacitor C that is inversely proportional to (B*l)2. The suspension compliance becomes an inductor L proportional to (B*l)2, and the viscous losses are represented by a resistor R proportional to (B*l)2. The equivalent electrical circuit between the voice coil terminals consists of R, L and C in parallel and then connected in series to the voice coil resistance Re. Series connection of the two voice coils doubles the wire length inside the magnetic flux, thus (B*l)2 increases fourfold. Therefore, C decreases to 1/4th, and L and R increase by a factor of four. Voice coil resistance Re doubles. As a result, the purely mechanical Qms, which is the ratio of resistance R to inductive reactance wsL, stays the same. The purely electrical Qes, which is the ratio of net voice coil resistance Re to inductive reactance wsL, becomes 1/2 of the single coil value. Qts, which is the parallel combination of Qes and Qms, is also approximately halved, provided that Qms>>Qes. Parallel connection of the two voice coils, however, will not increase the wire length inside the magnetic flux, thus, R, L, and C are the same as for the single voice coil. Only the voice coil resistance Re is reduced to 1/2. Again, Qms stays unchanged, but Qes and Qts are 1/2 of the single voice coil value. This is completely identical to the series connection of the voice coils. In summary, series or parallel connection of the two voice coils will not change the mechanical parameters, only how they appear electrically in terms of equivalent R, L and C values. Thus Vas, i.e. compliance, is unchanged as are mass, mechanical losses, and resonance frequency Fs. For series or parallel connection of the two voice coils Qms, Qes and Qts are the same. If only a single voice coil is connected and the other is left open, then Qes doubles and Qms remains unchanged. Thus Qts increases to almost twice the value of the dual voice coil case. A13 - Circuit boards are in stock and available. See | Circuit Board | for further details and ordering information. Each board contains the circuitry for one channel, i.e. for one input and the three outputs for woofer, mid and tweeter. In addition, the board has circuitry for a -3 dB/dec tilt control, and three notch filters for low frequency room equalization, in case it is desired. Use of the notch filters, though, presumes that you have accurate room response measurement capability to determine resonance center frequency, Q and attenuation required. You will need to calculate the necessary circuit component values and verify the equalizer response by yourself. I provide the formulas and a spreadsheet.. The circuit board is silk screened with component designators and component values. It comes with schematic, material list, loading list, frequency response curves and notch filter design information. You will need to provide the electrical components yourself, load them onto the board, solder them and test the completed board. The circuit board is also suitable for providing crossover and equalization when adding the PHOENIX dipole woofer to an existing panel speaker (FAQ10) or a small monitor (FAQ15). You probably want to house multiple boards in a chassis with input, output and power connectors. The board is 8" wide, by 7" deep, and two of them fit next to each other in a 17" wide chassis. An external +/-12 V power supply is recommended. A14 - The output depends on the path length difference D for sound reaching the listener from the front and the rear of the piston. For a flat circular baffle of diameter d, with the piston at its center, that path length difference is D = d/2, when measured on-axis and at sufficient distance. For the PHOENIX dipole woofer D = 19" (483 mm) between front and rear cabinet openings. For the PHOENIX main panel, which is folded back and rectangular, the effective path difference is more difficult to determine and approximately D = 12.5"/2 + 3.5" = 9.75" (248 mm). See Design Models A. Using these values for D you can calculate the frequency Fequal at which the dipole output is the same as that of a monopole, closed box speaker, with the same volume displacement (see FAQ5). The dipole output has a slope of 18 dB/oct and the monopole increases at 12 dB/oct for constant piston excursion with frequency. A15 - My answer to FAQ10 also applies to this case. I would imagine that a pair of dipole woofers added, for example, to a pair of B&W DM302 would make for a very natural sounding system. The dipole woofer would add bass output capability to the small monitor with minimal excitation of room modes and boom. It is very likely that the low frequen cy roll-off of the small speaker occurs around 100 Hz or somewhere close to the intended 100 Hz crossover to the dipole woofer. In such case the proposed high-pass filter solution of FAQ10 will not result in the desired 12 dB/oct crossover, because the monitor contributes phase shift and roll-off. This problem can be solved by using the circuit of Fig.9 from Ref.12, which allows correction of the monitor's frequency response in addition to providing the required high-pass function. The circuit can be constructed using my general topology WM1 printed circuit board. a - Seal off any ports on the monitor to convert it into a closed box speaker with 2nd order, 12 dB/oct roll-off, which is easier to equalize. b - Measure the frequency response of the speaker's impedance between its cable binding posts (including built-in tweeter crossover), as in Fig. 19, to determine closed box resonance frequency f0 and damping Q0 from the data as shown in Fig.18 of Ref.12. The free-space low frequency response of a closed box speaker is completely determined by these two parameters, Fig.17. Should you measure f0 close to 100 Hz and Q0 close to 0.5, then it is your lucky day and you need no further crossover high-pass filter to drive the monitor. c - Assuming no such luck, insert the found values for f0 an Q0 into the design formulas of Fig.25, with fp = 100 Hz and Qp = 0.5 for the crossover high-pass filter. Note that not all combinations of Q and f are realizable (k>0) and that you may have to juggle values a little bit. See Active Filter #9, f0Q0fpQp.gif, pz-eql.xls , True Audio. d - Find the closest matching standard R and C values to the ones you calculated in c. Scale the values to keep the impedance levels high enough (>1k) to avoid difficulties driving them. Analyze the circuit for the chosen standard values and readjust if necessary. A16 - The objective for the PHOENIX was to design a speaker that is true to the original. The original, unfortunately, is not always sonically pleasing, given various recording studio practices. I even include an optional 3 dB/dec response correction for tonal balance on the crossover/eq pcb for such cases. Tube amplifiers often add their own sonic signature and many listeners like their "warm" tone. If you use a tube amplifier which has such signature (probably the majority of commercial products), it will leave its imprint on all material you play through it and remove you a step further from the original. Thus, you will miss out on the truly good recordings. Supposedly, there exist a few triode amplifier designs of exceptional transparency. Usually their power output is below 20 W and insufficient to drive most speakers. A speaker with active crossovers, though, eliminates the waste of power that usually results from circuit losses and matching of driver sensitivities through passive R, L, C, crossover networks. The PHOENIX main panel should work really well with low power tube amplifiers, because of its high sensitivity over the midrange and the generally low power requirements on most program material for the tweeter (see FAQ20). The drivers represent an easy, low reactance load to the amplifier output transformer due to the restricted frequency range used. The output impedance should be low (<0.4 ohm) to maintain tight control over the voice coil motion. Solid-state power amplifiers are, by no means, automatically superior to tube amplifiers. Some of the early designs had notoriously high distortion levels of a character unknown from tubes. I also contend that design and construction of a highly transparent solid-state amplifier is far more difficult than that of an an acceptably sounding tube power amplifier. The difficulties of controlling the inherent non-linearities, wide bandwidth, thermal coupling and stability under all conditions of voltage and current swing, and load, are a real challenge even to an experienced analog design engineer, and require not only a solid understanding of devices, feedback control theory, radio frequency electronics and thermal design, but also extensive measurement capability. This is why I recommend to the DIYer power op amps like the LM3886, where all these aspects have been resolved and integrated at the chip level, thus greatly simplifying the remaining external circuitry (3886amp.gif, Crossover/EQ). A17 - My reason for a measurement is to glean relevant information from the data presentation. The waterfall plot (cumulative spectral decay or amplitude-time-frequency presentation) is full of processing artifacts due to the necessary windowing operation performed on the impulse response. This masks information and makes it difficult to interpret what you see. The time axis is usually too short (3 ms) due to lack of anechoic measurement conditions to present anything of relevance below a few kHz. Add to this dilemma the auto-ranging of amplitude relative to the highest peak in the initial frequency response. This has the effect that a tweeter with a 22 kHz resonant peak of 10 dB pushes the whole presentation 10 dB closer to its floor so that the spectrum appears to decay very rapidly. The plots have limited usefulness and must be read with considerable understanding of how they are generated, but they provide attractive advertising and magazine graphics. The concept of observing signal decay, though, is very relevant for finding stored energy phenomena. The impulse response contains all this information, but is difficult to interpret in most cases, because of its broad spectral coverage. I prefer to use a shaped tone-burst, 1kblkman4.wav, which concentrates the energy into a narrow frequency band, and observe its decay for different frequencies. The presentation is similar to the energy time curve, except that the ETC is dominated by high frequency (>1 kHz) spectral content, while I can probe any part of the spectrum with constant 1/3 octave resolution. A CD with recorded burst signals for room and speaker tests is available. A18 - There are two forms of distortion: linear and non-linear distortion. For linear distortion I measure the dB magnitude deviation of the frequency response from my performance target that I have set for on-axis and off-axis response of the speaker, utilizing the data that you can see on the System Test page. I measure phase response for summation of driver outputs in the crossover region. In the time domain I look at stored energy using shaped tone-bursts (FAQ17) to characterize drivers and cabinets. Non-linear distortion is characterized by the generation of new spectral components that were not part of the excitation signal. I measure distortion of drivers using a single tone and multiple tones (2 to 5) as input. The inter-modulation products generated by multiple tones are strong indicators of relative performance. Typically, IM products are of larger amplitude than the associated harmonic distortion products. I also check the excursion limits of woofer, mid and tweeter drivers vs. my requirements. A19 - The crossover to the tweeter is at a steep slope to prevent lower frequency signals from pushing the dome into large excursions. For constant SPL the dome excursion increases at 12 dB/oct as you go down in frequency. Thus, a 12 dB/oct crossover would merely keep the tweeter's low frequency excursions constant, not reduce them. Since program material usually has larger low frequency than high frequency amplitudes, this could lead to inter-modulation distortion in the driver. In my work on crossovers (Ref. 17) I observed that the phase distortion, i.e. the all-pass behavior, of the 24 dB/oct crossover has no audible side effects in this frequency range. See Design Models F.
I also noticed then that the very low frequency part of the spectrum is audibly affected by the system's phase response (further observations in: L. R. Fincham, "The subjective importance of uniform group delay at low frequencies", JAES, Vol. 33, No. 6, p. 436, 1985). This is the reason for keeping the dc blocking high-pass filter in the woofer channel to a low 2 Hz cut-off, even though it provides less protection for over-excursion of the drivers. At a 100 Hz crossover frequency the reduced phase distortion of the 12 dB/oct crossover gives more realism to the bass. The two 8" drivers, which roll off on their own around 40 Hz in the open baffle, can handle the extra excursion demands. I have recently investigated my phase distortion assumption which was based on observations with some earlier speaker designs. The differences that I had noticed then, must not have been due to phase distortion, because new tests give no indication of audibility. I invite anyone interested to test for themselves the validity of my observation. Contrary to what is frequently assumed, the low end of the spectrum appears to be the frequency range for audibility of phase distortion. Phase linear systems could be build using digital equalization. Unfortunately it is much more difficult to realize phase linear digital equalization and crossovers at low frequencies than at high ones, because the data blocks that must be processed become exceedingly long. A20 - Conventionally the sensitivity of a speaker is defined as the sound pressure level SPL that would be obtained at 1 m if driven with 2.83 Vrms at its terminals. This corresponds to 1 W input power if the terminal impedance is 8 ohm. The voltage sensitivity has been estimated (Design Models - I) for the PHOENIX as 90 dB SPL for the tweeter, 103 dB for the midrange above 250 Hz which drops to 96 dB at 100 Hz, and for the woofer as 95 dB at 100 Hz decreasing to 85 dB SPL at 30 Hz for a constant 2.83 V across the driver terminals. Since the actual terminal impedances are not 8 ohm, and since each driver is only used over part of its frequency range, because the active crossover limits the range that each amplifier has to cover, the effective load impedances become approximately 4.5 ohm for the tweeter, 3.5 ohm for the midrange and 6.5 ohm for the woofer. Thus in each case it takes more than 1 W to obtain the 1 m SPL given above. Woofer: 94 dB at 100 Hz, decreasing to 84 dB at 30 Hz. These numbers indicate that even modest amounts of amplifier power would result in very acceptable maximum sound pressure levels. Amplifiers that can deliver 10 W into the above impedances would allow 97.5 dB tweeter output, 109 dB over most of the midrange and 94 dB woofer output at 30 Hz. Q21 - Why does SPL increase 6 dB for two drivers in parallel, when the electrical power consumed only increases by 3 dB? When two identical drivers are connected in parallel, each piston moves with the same velocity as the single driver, because the current through each voice coil is the same as before. The total radiating area has doubled, and the radiated acoustic power has increased fourfold (10 log (4) = 6 dB) over that of the single driver. The electrical power consumed by the two drivers has merely doubled (+3 dB). With 4x acoustic power for 2x electric power you have a 3 dB increase in power conversion efficiency. The sound pressure p at some distance from the source is proportional to the square root of radiated acoustic power. When the piston area Ap is doubled and the piston velocity vp stays unchanged, then the pressure doubles (20 log (2) = 6 dB). In summary, when two identical drivers are connected in parallel and driven with constant voltage, then twice the electrical power is consumed (+3 dB), the radiated acoustic power is increased by a factor of four (+6 dB), and the free space sound pressure level is doubled (+6 dB) at a given distance. Note that piston velocity and displacement are proportional to each other and both are directly related to the current through the voice coil. With two identical drivers connected in series, piston displacement and velocity decrease to 1/2, but the piston area doubles, which leaves the sound pressure and radiated power unchanged (0 dB) compared to a single driver connected to the same voltage. Electrical power dissipation is now 1/2 (-3 dB) and again the power conversion efficiency has doubled. A source that is small compared to wavelength and radiating 1 W acoustic power into free space generates a sound pressure level of 109 dB SPLrms at 1 m uniformly around it. The SPL is 103 dB at 2 m and 89 dB at 10 m.
If the source has a power sensitivity of 86 dB SPL/1m/1W, then it takes 10(109-86)/10 = 200 W of electrical power to generate 1 W acoustic and 109 dB SPL/1m. The power conversion efficiency is 1W / 200W = 0.005 = 0.5%. Two drivers with 86 dB SPL/1m/1W connected in parallel will produce 92 dB SPL/1m when driven with the same voltage, but consume 2 W. At 1 W input the driver combination generates 89 dB, and it takes 100 W to produce 1 W acoustic power, thus the efficiency is now 1%. The two drivers could be a tweeter and a midrange and have very different piston areas Ap. If they have the same 86 dB output for 1 W input, then the tweeter must have much higher piston velocity vp than the larger piston area midrange. The volume velocity U = vp Ap , though, is the same for both drivers when they have the same sensitivity. A22 - As very open, transparent and detailed like that of a good electrostatic. Un-colored. Very dynamic, fast and with such resolution that you can easily follow the melody of an individual instrument in a mass of others. Imaging is very realistic if well recorded. All this also applies to the bass. You might first think that the speaker lacks bass because it does not give any hint of its capability until there are low frequencies in the program material. The low end is in proportion to the rest of the spectrum, rather than droning on as with so many box speakers. The PHOENIX is designed to be played at fairly realistic levels. It will sound thin when played at low levels, as expected from the Fletcher-Munson curve. The speaker will give you total involvement with the music when running at the proper sound level and you will not forget the experience. You might even learn to pay much closer attention to sounds around you, just like someone into photography becomes much more observant of the visual aspects of his world. The sound of the PHOENIX is directly comparable to the Audio Artistry Beethoven-Elite and Beethoven-Grand. Both are 4-way active systems, with additional drivers for the frequency range below 250 Hz, and intended for larger rooms and even higher playback levels, or lower non-linear distortion when at the same volume level as the PHOENIX. In all other aspects, like timbre, resolution, imaging and dynamics the three speakers are almost indistinguishable. The Audio Artistry Beethoven, which is a bi-amplified, 4-way active/passive crossover speaker system and forerunner of the B-Elite and B-Grand, was voted best "Loudspeaker Product of the Year 1998" by the staff of Stereophile Magazine. It was reviewed in Vol.20, No.11, November 1997 and is included in the Stereophile Archives . You could listen to the Beethoven-Elite in John Field's living room. 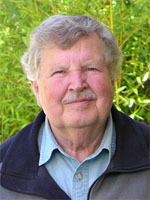 He operates the Tanglewood House B&B (+1-707-996-5021) in the California wine country north of San Francisco. A23 - I know of a number of people who are in the process of building the PHOENIX and some who have completed the project. I invite anyone to share their experience and observations with me. If you allow me, I will publish your web or e-mail address here, so that others may see what you have done or get in contact with you. Thank you for passing on what you have learned, so that others may benefit from it. If you are looking for opinions and occasional facts on any loudspeaker subject, then participate in the Madisound Audio Discussion . The topica dipoles forum is for DIYers building dipoles of all sorts. In the Planar Speaker Asylum you will find owners of dipole loudspeakers from various manufacturers discussing their merits. The hifi_dsp forum discusses digital crossover techniques. A24 - I start with a set of drivers that I have extensively tested and measured. I listen to test signals, music and voice without baffle. The close-up frequency response, harmonic distortion, multi-tone distortion, burst distortion and volume displacement have been measured. 1 - Decide on a 2-way, 3-way or 4-way system depending upon output volume requirements, allowable size or intended application. 2 - Design and build a proto cabinet(s) with dimensions based on estimates of necessary baffle size, diffraction and aesthetics. 3 - Mount the drivers in the cabinet(s) and measure the free-space frequency response on-axis, off-axis, horizontally and vertically. 4 - If the response is not uniform, then change the cabinet dimensions. Repeat steps 3 and 4 until the response meets the target. 5 - Design and build prototype line level filters to equalize the drivers for flat on-axis response. 6 - Measure on-axis response and repeat steps 5 and 6 until target is met. 7 - Design and build prototype crossover line level filters. 8 - Measure on-axis response and repeat steps 5, 7 and 8 until targets for in-phase and out-of-phase response are met. 9 - Measure the free-space frequency response on-axis, off-axis, horizontally and vertically. If the result is not adequate, then go back to step 4. 10 - Listen to the speaker in mono using a wide range of program material and test tones. 11 - If the results in step 10 are acceptable, then build a second cabinet(s), otherwise go back to step 2 or 5. 12 - Assemble a second speaker. 13 - Measure the second speaker as in step 9. 14 - Build line level electronics for second speaker. 15 - Compare both channels of electronics to each other for identical measured performance. 16 - Set up both speakers in the intended listening space. 17 - Listen to the system with pink noise in single channel, dual mono and stereo for symmetry of sound. 18 - Listen to a wide range of program material. 19 - Pause, rest your hearing, relax for a day or more. 20 - Listen to material which you have recorded with omni-directional microphones and with which you are very familiar. 21 - Pause, ask yourself how realistic the speakers sound. 22 - Make small adjustments to the frequency response if deemed necessary. 23 - Listen to a wide range of program material over an extended time period. Note if you get tired or want to hear more. 24 - Go to a concert. Listen to non-amplified sound, a symphony orchestra, jazz group, chorus, people talking, singing. 25 - Listen to your new speaker system and assess its capability. 26 - Sit back and enjoy or go back and start over again. A25 - A rear firing tweeter for the PHOENIX would increase the speaker's high frequency 4p acoustic output by 3 dB for an even more uniform power response. In earlier designs I actually used such a tweeter. Because of the physical size and separation of the two tweeters - in terms of wavelength - it is impossible to obtain a simple cos(a) polar response. Instead, the off-axis response will consist of multiple beams, where the outputs of the two drivers see each other, which is primarily off-axis. On-axis, in front, the rear tweeter contributes very little to the sound. Overall I have not found a real benefit resulting from a rear tweeter. The off-axis response of the single tweeter-midrange combination is well behaved and actually has its widest dispersion around 4 kHz. Above that point the normal increase in tweeter directivity comes into play. Also, a rear tweeter may cause reflections from nearby objects which affects imaging and makes speaker placement critical. I am therefore using only a front tweeter. A dipole ribbon tweeter would have the same potential problems as a rear tweeter. In addition the low 1440 Hz crossover requires large volume displacement capability. Typical high frequency ribbons would generate severe non-linear distortion under this condition. A ribbon of greater length would narrow the vertical polar response too much. The large amount of air movement due to the close proximity of the 8" drivers might modulate the movement of the low mass ribbon and lead to further distortion. I have not used a ribbon driver, because the ones that I am aware of do not seem to fit this application. A26 - Active loudspeakers make very efficient use of amplifier power, allow drivers of vastly different voltage sensitivity to be used together, and give maximum control over the motion of each voice coil. A 2-way speaker with passive crossover, for example, may run into amplifier clipping on a big bass note. In this process the high frequency tweeter signal, which is riding on top of the bass waveform, gets chopped off in the amplifier, causing large amounts of very high frequency distortion. This may lead to the unexpected result that the tweeter overheats and is damaged by a 50 W amplifier, yet it would be unharmed if the speaker was driven by a 200 W amplifier. If an equivalent 2-way active system was driven by separate amplifiers with 25 W for the woofer and 25 W for the tweeter, then the woofer may well clip and produce distorted output, but the tweeter with its own 25 W amplifier would never know about it. Often a higher power amplifier is assigned to the woofer to avoid the clipping problem all together. A 100 W + 25 W 2-way active speaker is capable of much higher undistorted output, than a passive speaker driven with 125 W.
The drivers in a passive system should have about the same voltage sensitivity. It is the driver with the lowest sensitivity that determines how much the crossover has to attenuate the signal for the other drivers, in order to obtain a flat combined frequency response. Voltage sensitivity is wasted. Amplifier voltage or current swing need to be larger than in an active system to obtain a desired sound level. In the case of open baffle speakers, which have a response that rolls off towards low frequencies at 6 dB/oct, it becomes quite impractical to lower the sensitivity of all other drivers to such an extend that the response is flat to a useful low frequency corner. An active system can equalize the open baffle driver by adding frequency dependent gain ahead of the power amplifier. Finally, in an active system each power amplifier is connected directly to the voice coil of a driver. This provides maximum damping and control of the voice coil motion, without the decoupling of capacitors, resistors and inductors of a passive crossover. The result is lower distortion. Some people are concerned about the direct connection of a >100 W amplifier to the tweeter voice coil, fearing damage due to low frequency turn-on and turn-off transients. Such fears are quite unfounded, because the slow transients cause little voice coil displacement below the driver resonance frequency. Of greater concern would be a permanent, large DC voltage at the output of the amplifier, but this can be easily checked with a voltmeter. A 200 mV DC output voltage would cause about 8 mW of constant power dissipation in the tweeter, which is insignificant. The greatest risk for damaging tweeters comes with swept sinewaves or MLS test signals of high power levels. The inaudible low frequency content can overheat the voice coil. An additional benefit to active crossovers is the easy implementation of a wide range of filter functions using operational amplifiers for crossovers and equalization. An understanding of the transfer functions of drivers and cabinets used for a particular speaker can lead to the design of active networks that precisely compensate for frequency response variations and give the desired overall response in magnitude and phase. Since opamps separate and buffer each filter section the design and fine tuning of the circuit can proceed without interaction. Modern opamps, such as the OPA2134 are sonically transparent, and absolutely no cause for concern. An understanding and the correct application of active crossovers and equalization, combined with appropriate choice of drivers and good cabinet design and construction, give the DIYer the capability to build loudspeakers with sonic performance that exceeds the best of what is commercially available. The additional components and amplifiers necessary for this task are a small price to pay when excellence is in reach. A27 - Dave Reite contributed the following method for testing the circuit board. "Once you have your active crossover/equalizers constructed here’s a simple testing procedure using a PC based sound card spectrum analyzer. You’ll need two each, standard 3.5mm stereo mini plug / two RCA plug cables, and one each double female RCA adapter. Connect one cable to your line out jack and the other to the line in jack on your soundcard. Connect the two white (left) RCA’s together with the double female adapter. The red (right) plug from the line out jack goes to the Phoenix crossover input and the red (right) plug from the line in jack goes to the selected crossover output. Note: If your sound card doesn’t support duplex operation, you’ll have to supply your own white noise source from something externally. (A test CD with a white noise track would be a good option.) A “Y” adapter to apply the signal to the crossover input and the white (left) plug from the sound card line in cable is all that’s required. In the spectrum window set “plot top” to 20, “plot range” to 60, “averaging” to 5, and verify “peak hold” is unchecked. Hit the RUN button at the upper left and within a few seconds you should see a very smooth curve of the output you’re measuring. Repeat as necessary on all the outputs and settings of the Phoenix crossover to verify its operation. Check the picture of SL’s MLSSA measurements for reference. Your results should look identical. I hope this helps. Comments/questions are appreciated. Dave Reite - daver@neptune.kpt.arl.psu.edu ." A28 - The shorter you make D, the distance between front and rear openings of the PHOENIX and H-frame woofers, the higher the frequency for which the rear wave adds in phase to the front wave, and the unequalized dipole output reaches its first 6 dB peak. Unfortunately, there is a resonance that comes into play before this peak. The cabinet structure between the driver cone and the cabinet opening forms an acoustic transmission line. If its length L ~ D/2 is large compared to the opening width and height, then there is a resonance when L = 1/4 wavelength. This is due to the acoustic impedance mismatch of the transmission line at the opening and at the cone. The resonance peak in the H-frame and PHOENIX W-frame occurs at lower frequencies, because the acoustic structure in front and behind the cone is more complicated than a simple transmission line. The H-frame woofer with D=12" has a physical length L of 6" for this "transmission line". This should give a 1/4 wave resonance at f = 13500 in/s / (4 x 6") = 563 Hz. The measured peak is more like 240 Hz. Thus, the effective acoustic length is about (563 Hz / 240 Hz) x 6" = 14". The reason for the difference lies in two places. One, the physical line is very short compared to the opening size and an end correction must be added which effectively extends the length of the line. Two, the driver frame traps air behind the cone so there is added mass that lowers the transmission line resonance. For example, the D=16" H-frame woofer with the Peerless 830500 drivers (photo) should have a resonance at (6" / 8") 563 Hz = 422 Hz, but measures with a response peak at 200 Hz. The Phoenix woofer with W-frame and D=19" should have a 1/4 wave resonance at 356 Hz but measures 270 Hz. In a similar cabinet with the same D but using 830500 drivers the resonance is at 190 Hz. Again, these are acoustically complicated structures. Exactly relating the physical length L to the acoustic length and resonance frequency only works if the transmission line is long compared to its cross-section. In practice it is best to measure the frequency response in the cabinet opening plane. with a given D would have its 6 dB peak, i.e. when the rear wave adds in phase to the front wave, because D = 1/2 wavelength. In the close-up frequency response measurement at the opening of the woofer cabinet this 6 dB peak cannot be seen, because the microphone senses only one side of the woofer. It gives the infinite baffle response without any 6 dB/oct dipole roll-off. Decreasing D moves the 1/4 wave resonance to a higher frequency, and allows for a higher crossover frequency to the midrange. But, it also reduces power handling of the woofer, since now larger cone excursions are required to reach the same SPL as with a larger D.
A29 - A simple wedge micrometer that is cut out of paper can be used on larger drivers to measure their peak-to-peak cone excursion. It is a rectangular triangle with 2:1 sides and a scale at its base line. Attached to the dust cap of a driver cone it moves back and forth. The eye cannot follow the movement, but sees a diagonal line that intersect the scale graticule. The axial movement is translated to a sideways displacement of the diagonal intersection and gives a twofold magnification of the excursion. While this is not a precise measurement instrument it is still very useful in relating acoustic distortion data to cone displacement. A30 - A dipole placed in a room corner should provide minimal excitation of room modes or resonances. The corner is a region of maximum sound pressure and it is well known that a typical monopole woofer in this location will couple optimally to all room modes. A monopole woofer would be a high impedance pressure source in the high impedance region of all wave modes (Z = p/v) and be optimally adapted to support them. A corner dipole, being a velocity and low impedance source, would have minimal coupling to room modes. Unfortunately, the H-frame and W-frame dipole woofers described for the PHOENIX cannot be placed completely into a room corner, because it would block their rear radiation. A minimum distance of 3 feet (1 m) must be maintained. L. E. Selmer (larryeselmer@netscape.net) proposes a corner dipole woofer that uses a different baffle arrangement and makes full use of a room corner. He claims that the sound from his first prototype shows exciting promise. I post his idea here for others to experiment with. I cannot implement it in my own room, because I have no clear corners. It should also be pointed out that the midrange panel needs to be placed near the woofer so that the distances from the listening position to the woofer and midrange are different by less than 1/8th of a wavelength at the crossover frequency. This might only work acceptably in fairly narrow rooms unless the signal to the midrange is electrically delayed. A31 - Yes, there is, from a sound reflection and also from a standing wave point of view. Both are a consequence of the figure-of-eight or cos(angle) free-space polar response of a dipole with its opposite phase front and rear radiation and very low output at 90 degrees off-axis. A diagram helps to clarify the case. It shows the plan view of a rectangular room with dipole D and listener L. The four hard room boundaries can be removed and replaced by four image sources D1 through D4. The special setup, where a = b, does not help with reflections 3 and 4 off the side walls. Moving the speaker away from the side wall reduces the strength of the reflection, because the radiation goes to an angle where the dipole output is attenuated relative to the on-axis level. In practice it may be difficult to move the speakers far enough into the room to satisfy a = b, but keeping them at least 1 m (3 ft) from the rear wall is recommended. Occasionally a cardioid free-space radiation pattern is suggested for a speaker, because it would radiate, like a dipole, 4.8 dB less power than a monopole for the same on-axis SPL. Unlike a dipole, the cardioid radiates weakly towards the rear. Thus, there is little reflection off the wall behind it. But, there is no cancellation when a = b. In addition there will be stronger reflections off side walls, floor and ceiling. It is important to understand that the discussion up to this point has only dealt with the first reflection off a single room boundary. The next order of reflections involves both front and rear walls and the image model would have to be expanded with additional sources. Successive reflections always occur and they lead to the gradual build up of stored energy in the form of room resonances or modes. Thus the cardioid speaker, even though it does not radiate towards the rear, excites a strong longitudinal mode between front and rear walls, similar to the dipole. The dipole, though, excites side-to-side and floor-to-ceiling modes only weakly, because they propagate along the null-axis of its radiation pattern. Furthermore, by angling the dipole its coupling to specific modes can be changed, whereas cardioid rotation has considerably less effect. The cardioid radiation pattern is the sum of a dipole and a monopole and its in-room behavior lies between the two constituent types of sources. It has the reduced total power output of the dipole into the reverberant field above the Schroeder frequency. It lacks in adjustability of coupling in the discrete mode frequency range where it behaves more similar to the monopole. The low frequency response rolls off at 6 dB/oct like for a dipole and has to be equalized. Unlike monopole and dipole the cardioid produces no first order reflection from the wall behind it. The dipole has minimum room mode excitation when it is placed near a pressure maximum (= velocity minimum) of a mode and when its axis of radiation is not aligned with the direction in which the mode travels. Pressure maxima are at the room boundaries and room corners. A dipole woofer should be placed near the side walls, provided the distance from woofer to listener is nearly the same as that from the midrange. Again, most likely practical limitations will have to guide best dipole speaker placement for room modes as well as for first reflections off room boundaries. A32 - The sound output of any speaker has reached its limit, when the distortion becomes objectionable. It may sound too loud and intolerable, even when the sound pressure level is not exceedingly high, because we unconsciously judge loudness by distortion. A clean speaker can play at very high SPL and you may not be aware of it, until you try to talk to someone and find yourself shouting. Before contemplating changes to the PHOENIX I would recommend to build it as designed and live with it for a while. It can play very loud. If you think you need more, then consider the following paths for upgrading during a second construction phase. The first step for reducing distortion in the PHOENIX would be a change from the 1252DVC/X6100 woofer driver to the XLS 830500. Next would be a change of the 100 Hz crossover from 12 dB/oct to 24 dB/oct, which reduces the excursions of the 21W/8554 midrange drivers at low frequencies, but makes woofer placement and integration more critical because of reduced frequency overlap. The steeper crossover also reduces the effective source size in an important part of the spectrum and makes the sound more subject to room effects. Finally, the number of woofers could be doubled. I would recommend these approaches rather than going to a 4-way system like the Audio Artistry Beethoven-Elite or Grand, because it will be difficult to realize their full potential with the tools and working knowledge typically available to the DIYer. I think the ultimate performance of the 3-way PHOENIX will be quite comparable or even superior, if the 4-way design is not executed perfectly..
Changing to the XLS 830500 for the dipole woofers requires the addition of a single WM1 or MT1 printed circuit board. The equalization is described in the documentation that comes with the pcb. Changing to a 24 dB/oct LR4 crossover is more involved, but not too difficult for anyone who has modified a printed circuit board before and understands something about filter design. The PHOENIX pcb has three notch filters for room equalization. Two of these can be changed to a 12 dB/oct highpass and a 12 dB/oct lowpass section to be wired into midrange and woofer channels. In addition, the 90 Hz 1st order highpass filter section in the midrange channel must be changed to a 2nd order highpass to obtain the other half of the 100 Hz, 24 dB/oct highpass filter. All this must be done while preserving the dipole roll-off compensation in the 10-300LP and the 90-500LP stages. The 90-500LP boost must be extended to 30 Hz to minimize its influence upon the 100 Hz crossover. Alternatively, unmodified circuitry from a single MT1 pcb can be patched into the PHOENIX midrange and woofer channels. This solution for obtaining a 24 dB/oct crossover is detailed in the MT1 pcb documentation. The same MT1 pcb can also provide the additional equalization that is needed for the XLS 830500 woofer. A34 - The low frequency roll-off of a woofer and its associated group delay are optimal, from what I have observed, when they follow the response of a 2nd order highpass filter with Q = 0.5. When a driver is mounted in a dipole W-frame or H-frame its mechanical resonance frequency Fs decreases to Fd, due to air mass loading, and Qts increases by a similar percentage to Qtd. For example, a driver with very strong motor, Fs = 18 Hz and Qts = 0.2 might have Fd = 16 Hz and Qtd = 0.22 as determined from an impedance measurement of the baffle mounted driver. With Qtd < 0.5 the low frequency behavior of the woofer is characterized in the complex s-plane by real axis poles at -69 Hz and -3.7 Hz and by 3 zeros at the origin. One of these zeros is due to the front-to-back dipole cancellation with its 6 dB/oct low frequency roll-off. The frequency response of this 3rd order acoustic highpass filter must be equalized to obtain a flat response. A suitable target response could be Fd = 20 Hz and Qtb = 0.5. It is easily realized with two shelving lowpass filters. The first filter with a pole at 20 Hz and a zero at 69 Hz corrects for the low Qts of the driver. The second filter with a pole at 20 Hz and a zero at 400 Hz compensates the 6 dB/oct roll-off due to dipole cancellation. The 3.7 Hz pole is low enough in frequency so that the response is dominated by the 2nd order roll-off below 20 Hz. An advantage of a low Qts driver is the ease with which it can be equalized for an optimum response with Q = 0.5. A driver with a smaller motor might give Qtd = 0.7 and Fd = 20 Hz, which leads to a pair of complex poles in the s-plane. This can be readily changed to a 3rd order Bessel highpass response by using a shelving lowpass filter with a pole at 20 Hz for the necessary dipole roll-off compensation. Likewise, if Qtd = 1 and Fd = 20 Hz, then an additional pole at 20 Hz, from the dipole equalization, leads to a 3rd order Butterworth acoustic highpass response. Third order filters introduce more group delay than 2nd order ones. It is therefore advantageous to use Qts < 0.5 drivers, even when they require driver roll-off equalization in addition to the normal 6 dB/oct dipole correction. A35 - The ORION evolved from the PHOENIX out of a desire for a smaller size speaker, one that is acceptable in many domestic situations. The PHOENIX has peak output volume capability that is just not needed in many homes, especially in living rooms of less than 400 ft2. Also, I had been searching for drivers that might match or exceed the performance of those used in the PHOENIX in terms of linear and non-linear distortion. More recently I had convinced myself that a LR4 crossover in the 100 Hz region has inaudible group delay distortion, which allows me to use a single 8" driver without sacrifice in output capability. Some ideas about softening the cabinet appearance worked out nicely acoustically. Combine all this and and more and you have the ORION. As it turned out, I believe that this speaker is the most sonically refined of all my designs. So much so that I do not need the physically much larger Beethoven-Elite for my personal listening enjoyment. Yet, I have not given up the satisfaction that comes from reproducing near realistic sound levels and dynamics. The ORION does all I want for the type of listening that I do in terms of frequency response, time response, spatial imaging and amplitude range, and with superb resolution in each domain. It draws me into the music better than any loudspeaker I know. If this speaker were used for Home Theater I would add THOR subwoofers below 40 Hz with a LR4 crossover, but not for 2-channel music listening. The ORION reproduces the acoustics of the recording venue so well that I have turned off my surround speakers for ambience recovery much of the time. A36 - There may be, but I would have to ask, better in what respect? I investigated alternatives for the Scanspeak 21W/8554 midrange and D2905/9700 tweeter by testing for non-linear distortion and stored energy. This was not an exhaustive search, but I went after what I considered most promising drivers, based on various factors that I knew from experience. I did not investigate ribbon tweeters, since I have no evidence so far that they could reproduce sound more accurately than some dome tweeters. The investigation of alternate woofers turned out to be very beneficial, because I found in the Peerless XLS 830500 not only a lower distortion and larger volume displacement driver than the 1252DVC and X6100, but these drivers are also no longer available. There are now probably additional 12" drivers on the market that would perform equally well. I have not investigated any further. Some have short voice coils and long magnet gaps, which results in very low distortion, as long as the required cone excursion does not force the coil to the edge and out of the gap. The SEAS Excel midranges and tweeter had slightly better measured performance in the parameters I tested for, than the Scanspeak units. I did not think the difference was worth redesigning the PHOENIX and, instead, I chose to try out these drivers in a new design concept, the ORION, rather than using the SS drivers again. As it turned out, the ORION is an improvement over the PHOENIX and the difference is greater than what I would have expected from the measured quantities. But there are other differences besides the drivers, which I feel contribute to this: The driver layout is M-T rather than M-T-M, the baffle and driver mounting are more open, the woofer to midrange crossover is different and the woofer is integrated. I have no intention to go back to the PHOENIX and to change its drivers. It is in my opinion still a good speaker, and capable of serving a slightly different purpose than the ORION. A38 - This question is best answered by looking at some actual frequency response measurements, though this does not answer to what extend diffraction is audible. Go to the Diffraction from baffle edges page. For an explanation of the physics involved see FAQ 8. A39 - It is often assumed that excessive amounts of power are required to drive a dipole woofer, because of the necessary 6 dB/oct acoustic roll-off equalization and additional boost required for drivers with Qts below 0.5. In fact, equalization does not change the power requirement. It is a driver's cone excursion for generating a desired SPL which determines how much output voltage and current an amplifier must be able to provide. I will illustrate this with an example example for two drivers, a Peerless 10" XLS 830452 and a Seas W26FX001, when driven from amplifiers with 180 W and 60 W into 8 ohm specification. Go to the Power amplifier limited SPL for a dipole woofer page to find the results. See also a related analysis of SPL limits for a closed box woofer . A40 - Practically speaking, the PHOENIX cannot not be driven from a single stereo power amplifier even if you had succeeded in designing a passive crossover filter that applies the same voltages to each driver as shown by the frequency response curves A, B and C of xo_eq2.jpg and the associated non-minimum phase response for C. The problem resides in the large amount of equalization that is required for dipole operation. For example, between 30 Hz and 400 Hz the amplifier power that is available to the woofer and midrange differs by 20 dB or by a factor of 100. Thus if you used a 100W amplifier to meet the low frequency needs, then only 1 W would be available around 400 Hz. That clearly is not sufficient. A wasteful 99 W is dissipated as heat in the resistors of the crossover. The obvious solution is to use a dedicated power amplifier for the woofer with an active crossover/equalizer between woofer and midrange. This leaves a passive crossover between midrange and tweeter. Now the drive voltage to the midrange needs to be attenuated by up to 14 dB or a factor of 5 in the crossover/equalizer. Again, this is wasteful of amplifier power which would be needed for the midrange. The PHOENIX prototypes exemplify the tradeoffs when using passive crossovers and equalization. Effective use of amplifier power. It takes more amplifiers, but these can be of lower power. For example, the ORION uses one 60 W amplifier for each driver and has a very wide dynamic range. Many more speaker design approaches become feasible by using line level filters. Even for a 2-way speaker with a single power amplifier it is advantageous to use line level equalization for the baffle step compensation (4p to 2p radiation). It is a more efficient use of available amplifier power to cut the high frequencies at line level, than to attenuate the highs by dissipating power in a passive crossover. At the same time the low frequency end can be extended by a line level equalizer. Less distortion at high sound levels. The woofer amplifier may clip, but the tweeter does not see the high frequency components that are generated. Distortion may not even be noticed. Compare that to a passive crossover speaker where the clipping of the power amplifier at low frequencies is not only highly audible but can also destroy the tweeter. In such case a larger power amplifier should have been used. The power amplifier is directly connected to the voice coil of the driver and exerts maximum control over its motion. In a passive crossover the impedance, when looking back from the driver into the crossover, becomes progressively higher as the stop band frequency is approached. Also any equalization carries with it an increase in impedance and consequently a reduction in control. Usually the first impression of a well executed active crossover/equalizer is one of greater clarity. With a passive crossover any change in voice coil impedance affects the network transfer function's magnitude and phase and causes a change in acoustic frequency and polar response. The driver impedance may change and recover slowly due to heating (+0.4% per degree C) at high signal levels, or change instantaneously due to large cone excursion and non-linear motor behavior. Such changes in impedance have no influence on the filter function of a line level crossover/equalizer and their acoustic effect is reduced. Sometimes concern is expressed over the use of operational amplifiers in line level filters and possible deterioration of the electrical signal. This can be completely overcome in my experience by careful signal level flow design and choice of excellent operational amplifiers, such as the OPA2134. My concern is with commercially available "electronic crossovers", both analog and DSP based, which may not have sufficient adjustability for the PHOENIX together with distortion free dynamic range. The finite number range of a DSP unit must be properly allocated to the signal demands of different filter stages at their location in the digital signal path. The PHOENIX printed circuit board together with the MT1 and WM1 printed circuit boards offer full flexibility for implementing all sorts of different active line level crossovers/filters.